Now that you have decided the time has come to consider a replacement cabinet set for your kitchen, you may find it easy to believe all cabinets are the same. Given the efforts of most cabinetry manufacturers to convince everyone that their products are the best, it is easy to see where you might be lulled into this belief. Since most people use their kitchen cabinets for storage, why would anyone want to invest in high quality cabinets when cheaper models do the exact same thing? As with almost everything you buy in life, when it comes to buying replacement cabinets you get what you pay for. If you invest in cheap cabinetry, you are likely to find that the basic structure is made from cheap particle board instead of real hardwoods or plywood. This particular material is known to have a particularly short lifespan. Considering the cost of even an inexpensive set of cabinets, no one wants to waste their money on cabinets that are not going to stand the test of time. 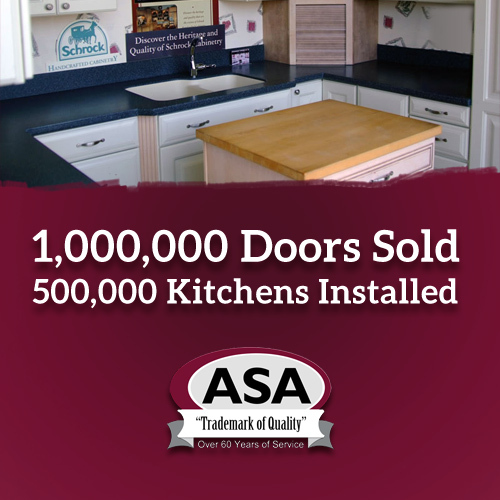 ASA Cabinets deals with only quality manufacturers that make cabinets that last for years after they’ve been installed. If all you are doing is remodeling your kitchen for the purpose of selling your home, a set of inexpensive replacement cabinets may be all it takes to spruce up your kitchen and add value to your home. This may be enough to ensure a quick sale. On the other hand if you plan to stay in your home for a long time, you need cabinets that will provide you with many years of service, as well as look great. Look for cabinetry with solid wood frames, hardwood boxes, and replaceable doors and fronts. This will ensure your new cabinets will provide you with many years of service and that they can be upgraded at a later date without having to completely replace them. Whether it’s a fast flip job or a renovation of your personal kitchen, ASA Cabinets has something for every project and every budget. Come take a look at our showroom in Walled Lake, Michigan and I guarantee you’ll find the perfect solution for your cabinets, doors, stair systems, etc. We’ve sold over a million doors and we plan to sell a billion more!